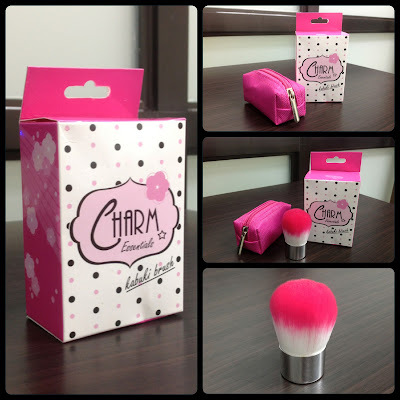 Hello friends, I just want to share with you my ultimate favorite makeup tool, Charm Essentials luxe mini kabuki brush. I've seen this tool receiving great reviews from many bloggers and I've been meaning to buy one because my kabuki brush from The Body Shop is too big and doesn't have a pouch anymore (misplaced somewhere). Good thing I didn't have to buy one thanks to Shen's Addiction 4th Anniversary giveaway. The box says that this Charm Essentials Kabuki Brush is made from the softest vegan hair and can be used to apply powder, blush, bronzer, even creamy and wet makeup. Good thing they included washing instructions so you'd know how to clean it properly. I love that the brush has its own sturdy pouch and it can fit even the smallest kikay kit. The bristles are densely packed and feel so soft on your skin. The versatility of the brush is another good factor because you don't have to bring several other brushes. This small wonder can already serve as a foundation, powder and blush brush. The color is just an added bonus since I love everything pink. The price is also something to look forward to because it only retails for Php 336. This is definitely a great buy for a good quality multitasking brush. Overall, I love this brush and I do recommend it to those of you who want value for your money. This is actually my very first brush from Charm Essentials and I am definitely buying their other brushes when I need to replace my older ones.